Marathon runner will donate all money raised to the Damien Nettles Reward Fund. In related news, suspects in the case are due before Police today. We’ll update you when we hear more. Fundraising efforts for the Damien Nettles Reward Fund are continuing, with news that a friend of the family hopes to raise money for Damien whilst running the London Marathon next month. Russell Bewley’s wife went to University with Damien’s sister, Sarah. On hearing of the reward fund, Russell has decided to raise some money and awareness for the Damien Nettles Reward Fund. You can Donate through Just Giving. 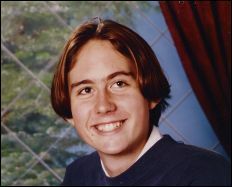 Teenager Damien Nettles went missing in November 1996. As readers will remember, in 2010, Damien’s case was changed by the police from a missing person case to that of a suspected murder investigation. The family feel in their hearts that someone on the Isle of Wight knows what happened to Damien and where his body lays. They are trying to raise funds for a reward that will lead to the arrest, conviction and recovery of their son’s remains. Suspects in the Damien Nettles case are due before Police today.